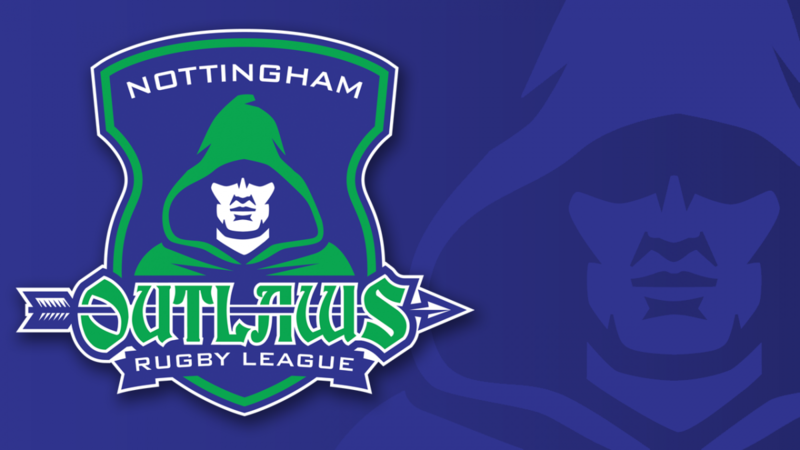 Nottingham Outlaws opening fixture in the 2019 Yorkshire Premier Division ended in a 36-10 defeat at the hands of newly promoted West Hull on Saturday. On a blustery day both sides played entertaining rugby and the Outlaws more than held their own for long periods of the game only to leak scores at key moments to a highly mobile West Hull outfit. The Outlaws took to the field with a much changed team to the one that crashed out of the cup at Bramley two weeks earlier. However the playmaking core of the side remained the same with Strachan, Cunliffe and Squires providing the spine of the team whilst James Young came into the halves to allow Alex whittle a run out in the unaccustomed prop forward role. Despite the long journey up to East Yorkshire the Outlaws started well and they opened the scoring. The move started with Strachan making a great break from acting half to take the Outlaws deep into Hull territory and a switch of play by Cunliffe saw the fleet-footed full back take the ball on the blind side to release Harry Binnion who dived in at the corner to make it 4-0 to the Outlaws with less than five minutes on the clock. Stung by this reversal the young home side began to move the ball with increasing speed back and forth across the park and they eventually found a way through as the Outlaws failed to align properly on defence and Connor Martin bagged his first of the afternoon to nudge the home side 6-4 ahead. The match then began to develop in much the same way that the Bramley game had two weeks earlier, with the Outlaws spending more and more time without the ball as the play became encamped in and around their forty metre zone. However good defence kept the Nottingham line intact and the scores remained at 6-4 after twenty minutes of play. However the game took a cruel twist at the mid-point of the half when Wil Martin was sin-binned for a minor offence at the play the ball and in the time he was off the field the West Hull backs ruthlessly exploited the gap in the centres as Reece Gooch grabbed a brace of trys to push the home side 18-4 ahead as the depleted Outlaws defence began to tire. To their credit the Outlaws rallied well when Martin eventually returned to the fray and they reduced the deficit on the stroke of half time as Jack McLeish pulled one back for the Outlaws and they went into the break very much back in contention with the home side holding an 18-10 lead. The Outlaws needed to make a good start to the second stanza if they were going to fight their way back into the game but they experienced the exact opposite when Ethan Shore grabbed a try out wide for the home side. The quick fire score seemed to knock the stuffing out of the Outlaws who conceded another try as Connor Martin completed his brace and at 30-10 the Outlaws chances of getting something out of the game had vanished in the face of some rapier-like attacks from the Hull threequarters. With the scoreline at 30-10 there was a real danger that Outlaws might be taken to the cleaners with twenty five minutes left to play and the injuries on the sidelines mounting. However the Outlaws rallied and they enjoyed their best period of the game as Strachan, Whittle and Squires marched the Outlaws down the field for a series of attacks but they couldn’t get the third try that their efforts deserved. As the clock ticked down the home side showed once more that they had the speed and pace out wide to trouble many teams in the division as Mark Sellers swept in from distance, pouncing on a loose ball to sweep sixty metres down the pitch to score under the sticks and with it close out the game with West Hull well and truly in command with a 36-10 scoreline in their favour. Despite the defeat there were still plenty of positives to take from the game with the side showing plenty of heart and effort despite being under the cosh for long periods of the game. However the will need to get a few more of their big guns back onto the paddock when they entertain Bentley in their opening home fixture at Lenton Lane next weekend.